To fit a bitless bridle you should run your fingers along side of your horse's nasal bone. You will feel that one part of the nasal bone (closer to the nose) is not supported by other bone structure. This is where you should NOT place your noseband. But if you run your finger a bit further up you will feel a hard surface on both sides. This is where you should fit your bitless noseband. 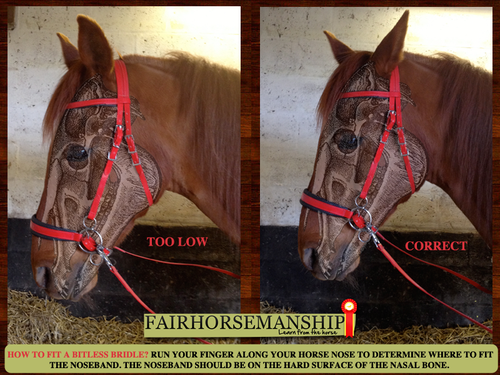 Below is an example of a noseband fitted too low (left) and one fitted correctly (right) Notice where the noseband is fitted and where is the nasal bone.